Crafty Spring roundup for this week! One of my very favorite crafting techniques is needle felting. 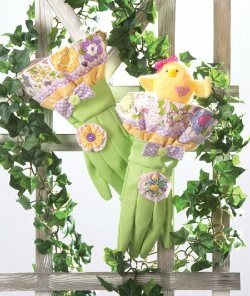 In this week's Creative Buzz is a cute little chick in gardening gloves. The chick is half a STYROFOAM TM egg shape and needle felted with yellow Wool Wisps from National Nonwovens. Super easy and quick! A cute Easter gift. This week a new episode from WCK, When Creativity Knocks, a chat with crafting icon Carol Duvall. I saw Carol at the winter CHA show, she is still going strong! One must wonder what she's hiding in the glove. She looks so very innocent. A little too innocent. Me thinks chocolate?